Aquarium of the Bay, located on San Francisco's waterfront at Pier 39, offers visitors a unique underwater experience. 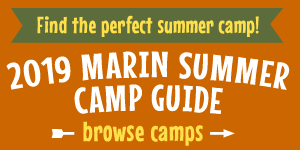 With an emphasis on education and conservation, it's a worthwhile destination for nature-loving Marin and Bay Area families. Compared to other nearby aquariums, like the Monterey Bay Aquarium and the Steinhart Aquarium at the California Academy of Sciences, the Aquarium of the Bay is a pretty compact affair. But it packs a lot into its relatively small space, and there's a lot for families to see and do. Get oriented in the Discover the Bay exhibit, where you'll learn about the creatures that live under and around the waters of San Francisco Bay. We especially liked the swirling school of anchovies and the moray eel. There's also a small but interesting exhibit called "Sharks of Alcatraz" that explores the different kinds of aquatic predators living in San Francisco Bay. When you're done with Discover the Bay, head down the hall to the elevators on your way to the Under the Bay section of the aquarium. This feature is really what makes Aquarium of the Bay stand out. Walking through the two acrylic tunnels with sea creatures swimming past you and over you is an amazing experience and has to be the next best thing to scuba diving under the Bay! The first tunnel takes you under the near shore, where you'll encounter sea stars, rockfish, giant sea bass, and more. The second tunnel takes you out into deeper waters, where you'll get up-close-and-personal with a variety of sea creatures including leopard and seven-gill sharks, rays, and the prehistoric-looking white sturgeon. It's a really spectacular underwater experience. On the way, you'll also get to meet several different kinds of jellies as well as the aquarium's resident giant Pacific octopus. When you're done here, head back up the elevators to the Touch the Bay section where, as its name implies, you can touch a wide range of creatures including leopard sharks, bat rays, and sea stars. The Touch the Bay exhibit also includes the PG&E Bay Lab, which presents interactive activities with land animals like California kingsnakes, blue-tongued skinks, and even pink-toed tarantulas. Finally, you'll encounter the aquarium's resident family of river otters, who are a lot of fun to watch as they swim and climb around their large habitat. Aquarium of the Bay is located at Pier 39 along the Embarcadero in San Francisco. Hours vary by season, right now its open daily from 10 am to 6 pm. Admission is $22.95 for adults, $13.95 for children ages 4 to 12 and seniors 65+ or $68 for a family of two adults and two children. San Francisco residents pay a discounted rate of $19 for adults, $11 for children and seniors. Parking in the area can be challenging. Your best best is probably the adjacent Pier 39 garage, which costs $9 an hour; if you eat at a restaurant on the pier you'll get an hour of validation. We had a great lunch at the Hard Rock Cafe, which currently offers a "Sunday Fundays" family special where kids dine for free on Sundays from 11 am to 2 pm (one free meal for kids 10 and under off the kids' menu with each adult meal purchased). Find out more here. To get there from Marin, take Highway 101 south over the Golden Gate Bridge. Follow Doyle Drive onto Lombard Street, then turn right on Bay Street. Take Bay to the Embarcadero and turn left. Pier 39 will be on your right and the garage to your left. An alternate way to get there is to take the Golden Gate ferry to San Francisco and then hop on the F line streetcar at the Ferry Building and take it down to the pier.